The dude was everything I hated about everything. “Hungry Heart.” I said. 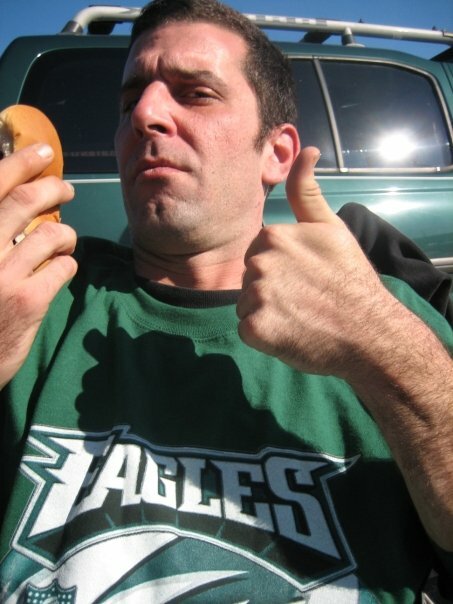 I had my longsleeve bleed green Eagles mock jersey on and a cup of Bud Lite. During the “na-na-na-na-na” part I noticed a south Philly betty in a denim skirt and chick jersey dancing and making eyes at me. Then she started saying, mouthing something at me. I couldn’t believe it my rock and roll dream was finally coming true. I walked out into the crowd towards her. I tried to take her hands and pull her in close to dance. I didn’t see her Bud Lite cup and somehow managed to spill her beer all over her stomach and legs. “No!” she shouted over the D-bags botched chords. Tip him? For printing out chord charts of the oldies and playing his guitar in the parking lot at a football game? Try playing above an Ethiopian restaurant in a bar the size of a 1br apartment for 4 years, Dave Matthews. He should be tipping me! I still wanted her though. I walked over to the guy and pulled the ones from the night before out of my pocket. I put them in his bucket. He finished the song. I reached into the bucket. I pulled out the ones with the sharpee messages on them. Sometimes your own enthusiasm is all that stands between you and a hostile situation. No one wants to get angry with you if you’re happy. Even if they do your joy will often confuse them long enough for you to get away. Me and Mark would literally bring the roof down at the Khyber that night. It was a Hostile City Dance Party and our Guns N Roses weekend was far from over.